Heat the oven to 220°C/200°C fan/gas 7. Put the flour in a mixing bowl and mix in the salt. Add the butter then, using your fingertips, rub the butter into the flour to make a coarse breadcrumb texture. Using a table knife, stir in the sugar, then make a well in the middle and pour in the milk. Mix the dry ingredients into the wet using the knife to give a sticky dough. Lightly flour the work surface, then tip out the scone dough and lightly knead a few times until smooth. Roll out (or pat out on the work surface) to 2.5-3cm thick. Flour the cutter well, then press firmly on the dough to stamp out scones. Don’t twist the cutter as you press down. Gently re-roll the leftover dough and stamp out more scones (you should get 8 in total – don’t go thinner than 2.5cm or they’ll look flat). Transfer the scones to a baking sheet, dust the tops with a little more flour (or brush with clotted cream), then bake for 15 minutes until well risen and golden. Transfer the cooked scones to a wire rack to cool, then serve split in half topped with a good spread of butter and/or clotted cream and some good quality jam. Scones are best eaten on the day they’re made, but they freeze well. Once cooled, freeze in bags for up to 1 month. Defrost, then warm in the oven. 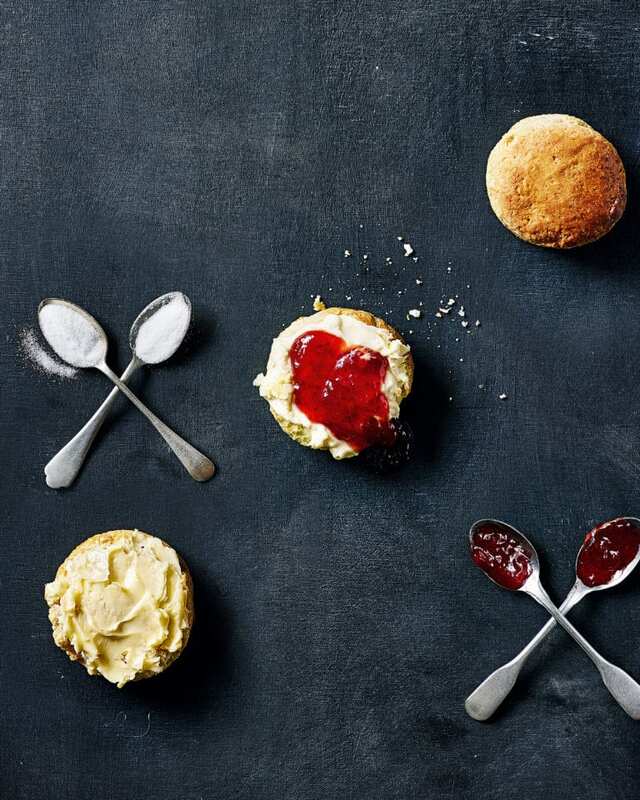 The scone debate: jam first or cream first?